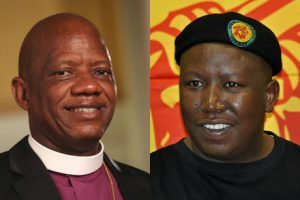 [Diocese of Johannesburg] The souls of South Africans are slowly being eaten away by the hate speech of people like EFF leaders Julius Malema and Floyd Shivambu who have clearly embarked on an offensive of naked racism to harm the country. So says the Anglican Bishop of Johannesburg, the Right Revd Dr Steve Moreo, in a statement released today and sent to the members of his diocese in Gauteng. He was commenting in particular on recent utterances by the EFF leaders against Indians. The racism being peddled by Malema had become a cancer that was eating away at the rejuvenated healthy cells of ubuntu that had followed 1994. Great leaders such as Nelson Mandela had shown how a spirit of big-heartedness and reconciliation, of seeing people through the African eyes of ubuntu, could begin to craft a South African renaissance that had been the envy of the world for a while. But the hatred inherent in racism was actively eating it away like a malignancy. The bishop said that there would always be differences between people. But the tendency in many quarters to single out race as the great differentiator was an illustration of evil forces at work. “It is not only the Malemas who should desist in this, but all of us. People in business, the entertainment world, on the sports field, in the home, wherever, should think carefully about what they say. Ubuntu, reconciliation… those should be our watchwords as Africans living in this country. Bishop Moreo said people of faith should renew efforts to play a leading role in demonstrating the love of one another which all religions espouse. Welcome to our exciting news service. We email a selection of stories about three times a month directly to your inbox. You will automatically receive this if you are on the ACSA mailing list. If you are not on the list, please log into MyAnglican and register or check your details. Feel free to share or forward mail addresses of friends, family and parishioners if you think they would like to receive news. Be assured that contact information will not be shared with other parties/marketers. The anniversary of the fire which devastated the Knysna area in the Diocese of George took place on 7th June. A Service of Thanksgiving for the recovery from the fire was held at Holy Trinity Church, Belvidere to mark the occasion. Below is a a reflection from the Rt Revd Brian Marajh, Bishop of George, followed by a link to a video interview with the Revd Jerome Prins, Rector of Holy Trinity. What is interesting and significant is the problem he has in explaining away the phenomenon of why, in a supposedly impersonal universe, loving concern for the welfare of people in trouble is shown, by other people, who are perfect strangers. A year ago, we witnessed an incredible outpouring of love and generosity, when Knysna and its surrounds in particular, were engulfed in flames. The caring and compassion on the part of people from all over South Africa and beyond, made an indelible impression on all concerned. Many of those whose homes were destroyed by the raging fires bear testimony to the incredible caring they experienced throughout the ordeal. People opened their homes to perfect strangers and offered hospitality. The disaster generated the most amazing generosity, as people in faraway places rallied to the needs of the dispossessed. Food and clothing and other items came pouring in from companies, service organisations and individuals. I am proud to say that many Churches in our Diocese and the wider Province responded to the crisis. In Knysna itself, local Churches organised themselves into distribution centres and were in the forefront of distributing the necessities to those worst affected. The 7th June 2017 will never be forgotten. Knysna and the other places which suffered such horrendous damage are being restored. People are resilient and are getting on with their lives. But, those Christlike qualities which were manifested during the fiery ordeal, by so many people, residents and outsiders alike, will never be forgotten. From the firefighters, who were in the forefront, battling the flames, to those, behind the scenes, packing food parcels – everyone who helped, sent a strong signal to the Community at large, that people are essentially good and through their endeavours, God is involved in what is happening. Jesus is the Resurrection, in the present tense. And we are his hands and the instruments of his restorative grace in the world today. The fires were dreadful, but the response was overwhelming and vindicated and reinforced our faith in God’s amazing providence and concern for those in need. In the final analysis, goodness will always prevail. Because God is good and life is to be celebrated. Let us continue to uphold one another in prayer. Let us at all times remember when things are at their worst, God is at His best. Father Jerome Prins reflecting on the 1st Anniversary of the Knysna Fires. Location of Post: Cathedral Centre, 169 Langalibalele Street, Pietermaritzburg. The Diocesan Secretary is the senior executive responsible for the management of the administration in the Diocese of Natal. The incumbent reports to the Bishop of Natal. Holding regular meetings with senior staff. Excellent verbal and written communication skills in English (the ability to communicate in isiZulu is an advantage). To be a practising Anglican would be an advantage. A relevant Bachelor’s Degree (Finance and Management). Successful shortlisted candidates will be notified by 31st July, 2018.